We are thinking about having another batch of G4 competition drive shafts made. These will NOT be like the first lot which broke, but like the replacement batch which have stood up well to race conditions. 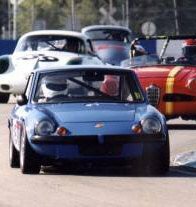 Last weekend Fos Wilson competed at Snetterton in the HSCC 70s Roadsports Championships driving a MG Midget we prepared and support for him. He won his class in one race and was second in another. Don Francis in his Ginetta G4 is currently points leader in his Historic Rally Series. None of the bits we made for him have fallen off and the car will be coming back for an aeroscreen to use in the balmy summer that is just around the corner. A web surfing author was so impressed with the pic of Mark below that they asked Spadge for permission to use it on the cover of their new book. On the left Mark "racing" at Spa Sunday shortly before a mechanical problem at the top of Eau (how appropriate) Rouge had him integrating with the crash barrier. Spadge, racing in a mixed class on compulsory historic tyresagainst beasts on wet weathers, observed his role was that of mobile chicane. Monday the G12 was back in England, repaired, and awaiting paint.against beasts on wet weathers, observed his role was that of mobile chicane. Monday the G12 was back in England, repaired, and awaiting paint. David Dawson, erstwhile ex-Ginetta G15 owner and Evante racer informed Spadge only this morning of some potential changes to 750 Motor Club Production Sports Car Racing Rules. This should enable Ginetta G4s to run a wider variety of engines and also may permit Ginetta G15s with engines transplants such as Alfa Romeo, etc. It may also allow the Ginetta G26-31 range in. It seems to be the place to race a Ginetta G27 these days. There are a number of good competition cars out there that are now not eligible for the One Make Series; they are remarkably good value and go well. Apparently at a recent 750 Motor Club race Nick Hamilton was going well and had the lap record in sight. Howard Jones in his Ginetta G4 won his class as usual. On a recent road trip to Scotland, Spadge dropped off a Ginetta G32 shell to Dave and Nina Baker as spares for their much developed hill-climb car. Knowledge that they have all the repair panels they ever need should be worth at least two seconds off their times this year we hope! With the weather so disgusting here at the moment it is good to reflect back on sunnier times. Not as much racing this year as we'd have liked but we are fully committed to making up for it next year with a variety of Ginetta G4s and G12s and maybe a Ginetta G10. This picture was found lurking on Spadge's desk recently. It shows him, rather than Mark we think, obviously having just overtaken the Marcos. Now someone inexperienced, untrained or just plain cynical may look at it and proclaim that the Marcos looks as if it is "right up the chuff" of the pretty little G12. This is of course, entirely understandable but also incorrect. Spadge assures us that having pulled off a manoeuvre of high skill and daring to get by the Marcos, he took a call on his mobile phone and momentarily eased off the gas. This will not be happening again as he has promised to leave the phone in the pits next year and the engine has been rebuilt and run on the dyno with a huge improvement in performance. 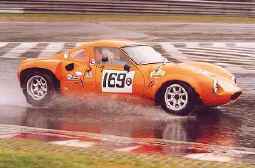 Don Francis's Ginetta G4 won the last event that he competed in in Europe. Well it must be a good time to pull it all to pieces then! We have made and fitted a roll hoop and roof. We are upgrading the fuel tank, suspension, cooling system and various other bits and bobs. We hear that our pal David Baker in Scotland recently won his class at a hillclimb in his new Dare G4. His car is one of the long cockpit versions which are unofficially designated as G4 L.A. (Lard Arse!). 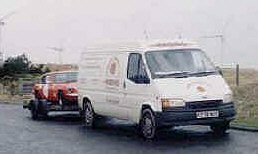 These have been developed with the larger customer in mind and we have it on good authority from Dave himself that he was instrumental in nagging Ivor Walklett over a number of years to make this development. There were other pie fiends involved too, we think! Anyway, well done David. Steve Smith in Florida, regularly beats Camaros and Corvettes in his G15! The last fun we had with the Ginetta G12 was at a test day at Snetterton. Mark shared the car with Howard Jones (He of the successful Ginetta G4 in 750 Roadsports). The idea was to give Howard a taste of G12 motoring and to see if Mark (and therefore Spadge) were significantly slower than Howard, since he had been teasing us for going too slow! Howard enjoyed numerous spins on his first outing but Mark was going well. The suspension changes had made a big difference. Once Howard had learnt that the great big red button with a shield round it was the extinguisher and not the starter button, and once Mark and Spadge had mopped up all the foam from the engine bay and cockpit and borrowed another extinguisher; Howard went a bit quicker – or was he just recovering from the spins more effectively?! The engine then began to pressurize the sump so we called it a day. Subsequent investigations have led to new pistons and valves and a very healthy dyno sheet. This coupled with work pressures effectively ended our season but we have high hopes for next year. Spadge is also scheming a drive or two in several G4s – hopefully some of which may actually come off! Mark and Spadge enjoyed a successful test day at Goodwood recently. It was a beautiful day and the car went well. The gear changes are getting easier and the car went even quicker once the full weight saving benefits of the starter motor falling off, manifested themselves. Look out for us in Classic and Sports Car magazine in the June or July issue (out a month earlier than the title usually). It is looking likely that Spadge will drive Mark Faulkner's superb Ginetta G12, chassis number 1, the ex John Burton Car in the Cloth Cap two driver races this year. Not content with that, he also hopes to share Chris Stapleton's Ginetta G4 at the same meetings and possibly some others. One of the very few Ginetta G12P cars produced from the moulds in the USA before they returned to the UK has recently changed hands over there. It is fairly complete except for trim and paint and seems very similar to the original. You too, could own one of these beauties! "Spadge, Roadsports in 750MC is getting really fast. Rick Lloyd managed 51.31 in the race in his +8 against my 56.97. So some way to go before I get into the 55's. It was a bit cool and windy. The grid was thinned in practice when the owner of Cliff's Dare Ginetta G4, Geoff Gibson, managed to bend a wheel and wishbone first time out within 6 laps, after an earlier spin, and a Clan Crusader ran its bearings (too fast with a wet sump?). In the race Pete Richards' Clan Crusader crashed quite heavily on lap 3 on the exit to Gerards, though I was well in front after a demon start. So I ran out a class winner with fastest lap. Not a bad start to the season. Next out Donnington on 30 March, hopefully with more competitors. I am considering the Top Hat meeting at Donnington on 4-5 May for the Best of British race. It is only one week after a 750MC race but if I can, I will. Regards, Howard."